We believe that Israeli communities can be better-stronger, more caring, more interconnected. In order for Israeli Jews to feel connected to their country and each other, they need to share a common culture. That can only happen when there is spiritual leadership to make it happen. Barkai will train ordained Religious Zionist rabbis to become communal professionals with a skill set that includes family counseling, practical halacha, mediation, coaching and the like to the benefit if all Jews living in Israel. Jewry abroad has benefited from communal. In recent years, Israelis have come to see the value as well. Communities are seeking out rabbis appropriate to them and Israeli rabbis who did not grow up with the community-oriented approach are seeking the expertise they need to fill this crucial role. The Zionist, Modern Orthodox communal rabbi is a bridge- connecting Jewish communities and connecting people to their own heritage. Barkai is making it happen. Barkai was founded in September 2011 in Modiin by Rabbis David Fine and Shlomo Sobol. 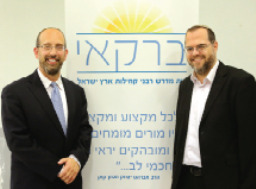 In September 2012 Rabbi Yisrael Meir Lau became Barkai's president. Barkai welcomed its first cohort of 19 fellows in October 2012.